I’m still in denial. I’m pretty convinced that my dear ol’ dog is going to live forever. If I ignore the aging process intently enough, it just stops– right? Is anybody with me on this? In an effort to appease the ol’ girl, I feed her stuff. Lot’s of it. Let’s be clear that I did not say crap. I do not feed my dog crap. If I wouldn’t eat it, my dog is surely not getting it. Corn, fillers, binders and chemicals surely are not the stuff that old dogs are made of. That is for sure. She’s not allowed in the kitchen and is very respectful about the rule. She used to not be a beggar either, but one day I decided to forgettaboutit, because she’s in her golden years, and heck, everyone deserves a little kale, apple, carrot, lettuce, spinach, celery, sweet potato and radish scraps in their golden years! You get the idea. I basically give her little bits of whatever I’m cooking up, in addition to her carrot to chew on. She gets a carrot a day, (if I can remember to give it to her), and that makes her happy. (Please note: not all foods are good for dogs, and some like onions and xylitol are toxic and even fatal. Do your homework, (that’s a theme around these parts), and feed your dog foods you are comfortable with, and at your own risk. I am in no way advocating that you make your own dog sick! Here’s a helpful list to start, and I keep a list of NO-NO foods on my fridge). Since buying manufactured dog treats are: A). not in the budget, B). stinky, and C). 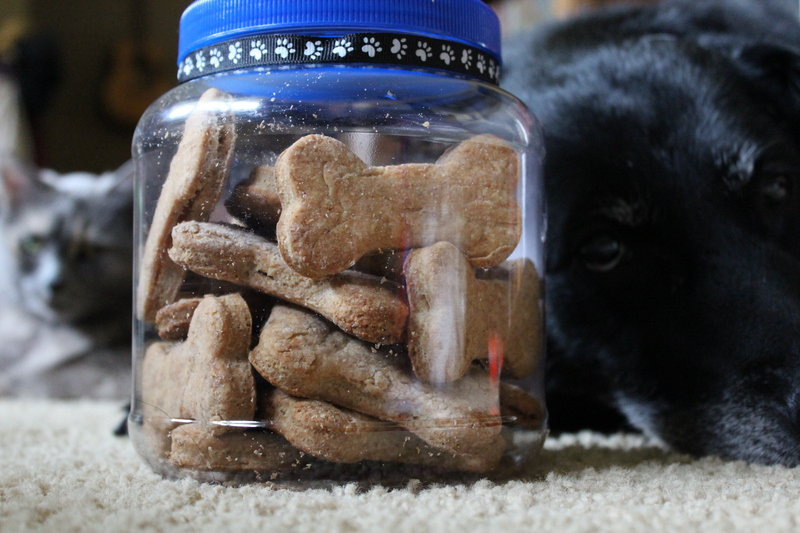 laden with mysterious ingredients, we don’t buy them for our Wonder Dog. She, like every other dog, appreciates a good dog biscuit though, so in addition to her fruits and veggies she gets biscuit treats. 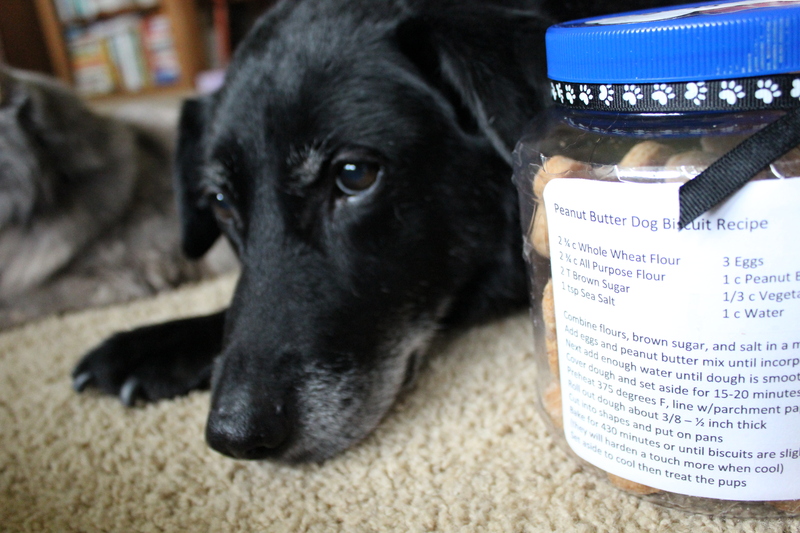 We have a nice and easy recipe for some homemade Peanut Butter Biscuits–For Dogs, that comes from Dear Husband’s Aunt, who is a terrific homemaker 🙂 Since most dogs love peanut butter, these will be a hit for certain! Combine flours, brown sugar and salt in a mixing bowl. Add eggs and peanut butter and mix until incorporated. Add enough water until dough is smooth and workable. (They will harden a bit more when cooled). 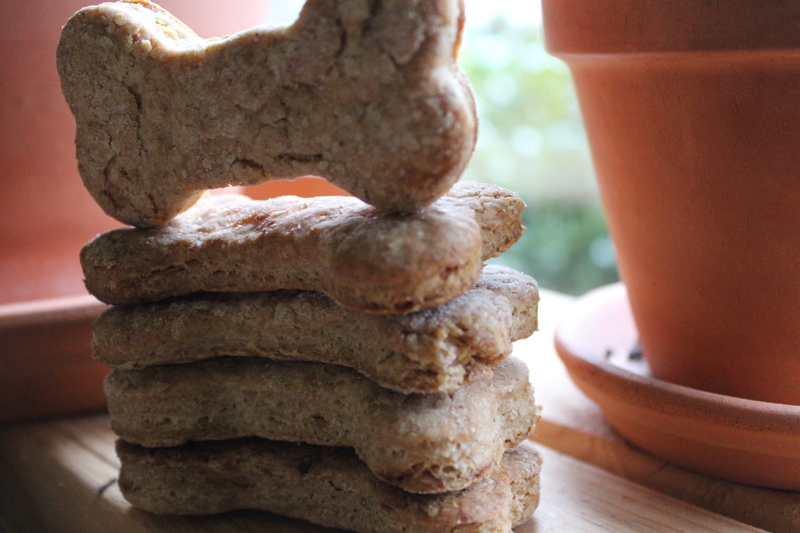 Whether you have an old dog, new dog, red dog, or blue dog, every dog needs a biscuit! Is anyone out there??? If you’re reading this, and you love your pooch, post their stats in the comments! I want to hear from you dog-lovers! Ooh. How long do these last for you? The batch I have right now I have had since Christmas! Baking them today 🙂 Im sure my 3 doggies will love them! They adore peanut butter. Will have to try these! I feed our dog “real” food too:) Most every meal has rice but then I include a meat & veggie. Usually leftovers so they don’t go to waste & I know what she is eating! Thanks for the treat tip! Great post – I’ve sent it to my daughter and son-in-law…. they take care of my two awesome grandpuppies and thought they might like your recipe. Thanks for sharing – I found you through The Creative HomeAcre! My dog would gobble the entire thing up! Looks to be a great recipe! My puppy girl is also in her golden years (soon to be 13 human years). “Tag” has been with me thru thick and thin – even saved my life! She gets healthy dog food and lots of healthy goodies -carrots, apples, etc. I’ll be making her a batch of these goodies, as soon as i can get to the store for the flour. (we’re gluten free around here). Thanks for sharing!! Linda, I am glad to hear from a kindred “old dog” lover! Aren’t they the best?! Husband and I considered only adopting old dogs from here on out. I had a thought, what about just making Tag a GF version of these with whatever you have? Aw, such a sweet story 🙂 I am going to give Venus one of those treats now because I get sad thinking about the inevitable. I heart Senior Dogs! we have 2 rotties, 1-10 yrs, & 1-11 mn., and they both “LOVE” anything peanut butter, so I’ll be making these, and sometimes add carob chips, grated carrot. Thanks for the recipe !!!! Aww, these make me want to spoil my dog. Thank you for linking up at Wildcrafting Wednesdays! I made this biscuits, I did make some changes tho, used applesauce instead of oil & added a mashed banana-only because it was there- I rolled the dough into logs, chilled & then cut into rounds. baked them as recipe said & then left them in the oven all night. my dog, Waffles, LOVES them. I will be making them again. thank you so much! We also adopted an old dog and hope that he lives another 7 years! Its hard not know the exact age isn’t it? The treats look easy too I think I will try them out! It is very hard not knowing the age, but in a way–better. Because then I have less to fret over for how much longer she will live. I keep telling myself she is a young dog with mobility issues 🙂 Try the biscuits, you guys will love them! Our dog, Splotchy, is only 4, but has some arthritis in her back leg. I love making treats for her and am definitely going to make these.